Head of the Strategic Research Center of Iran’s Expediency Council Ali Akbar Velayati hailed the growing relations between Tehran and Beijing, saying it is important to further develop the ties to strategic levels. 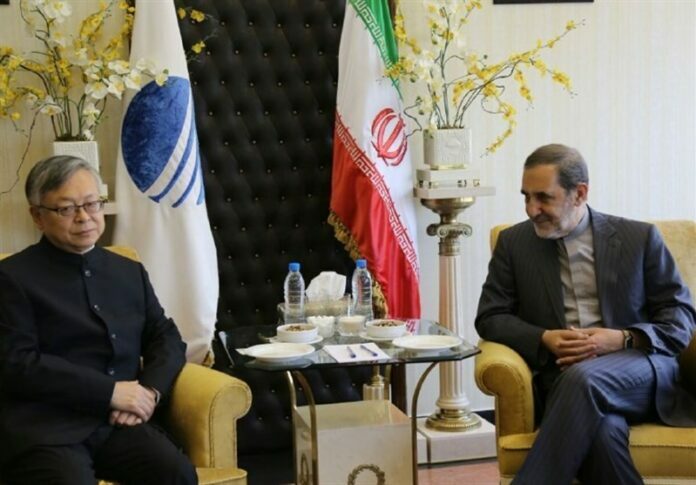 The Islamic Republic of Iran attaches significance to elevating the relations between the two countries to broad and strategic ties, Velayati said Wednesday in a meeting in Tehran with Chinese Ambassador to Iran Pang Sen. He also called for more cooperation between Iran and China on resolving regional and international issues. Pang Sen, for his part, described the level of bilateral ties as satisfactory, saying that since the Chinese president’s visit to Iran earlier this year, the Sino-Iranian relations have significantly developed. During Chinese President Xi Jinping’s official visit to Iran back in January, the two country’s officials signed 17 documents for cooperation in economic, industrial, cultural and judicial fields. The documents included one signed between Iranian and Chinese nuclear chiefs for peaceful energy cooperation. Others involved documents for environmental cooperation, financing of a bullet train railway and banking cooperation. China remains Iran’s top trade partner. The value of trade transactions between Tehran and Beijing stood at some $52 billion in 2014. In recent years, the two countries have developed their military relations as well. Earlier this week, the defense ministers of Iran and China signed an agreement in Tehran to enhance military and defense cooperation between the two sides. The agreement entails closer defense-military cooperation between Tehran and Beijing, sharing military experience, particularly in the field of training, as well as combatting terrorism and causes of regional insecurity.